And no, I did not make up that hat. Rumi really did wear a giant painted golden walnut on his head. 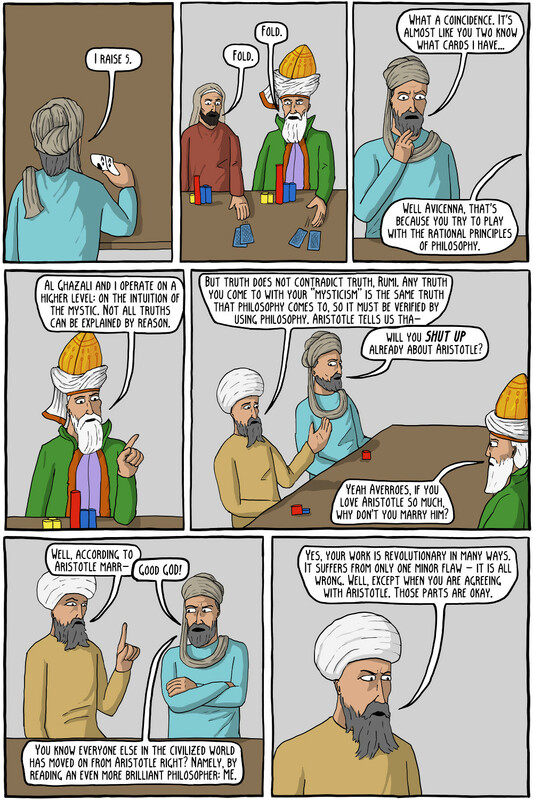 Avicenna was a Persian philosopher, doctor and logician of the 11th century. He is probably the most important thinker of the Golden Age of Islam, revolutionizing multiple fields of thought, particularly philosophy. His ideas on Existence and Essence and his own adaption of Aristotelian metaphysics were highly influential, and he became the central figure for philosophy in the Islamic world. Averroes was a 12th century Philosophy, best known for his commentaries on Aristotle. He thought a lot of the revisions of Aristotle's thought were wrong, in particular people like Avicenna, who tried to merge Neo-Platonism with Aristotelean thought. While his ideas never were very popular in the Islamic world, where Avicenna had already supplanted Aristotle and the most studied thinker, he was extremely important in spreading Aristotelean thought into the West. For many places in the West, the first copy of Aristotle to arrive was translated from Arabic, along side with Averroes's commentaries. Al-Ghazali was an 11th-12th century Islamic mystic. He was best known for his criticism of Philosophy is his book The Incoherence of the Philosophers, which rejected the philosophy of both Aristotle and Plato (and therefore most of the Islamic philosophers who had been working off them). He instead claimed that the world was only caused by God, and could only be understood through the Sufi practices (mysticism). 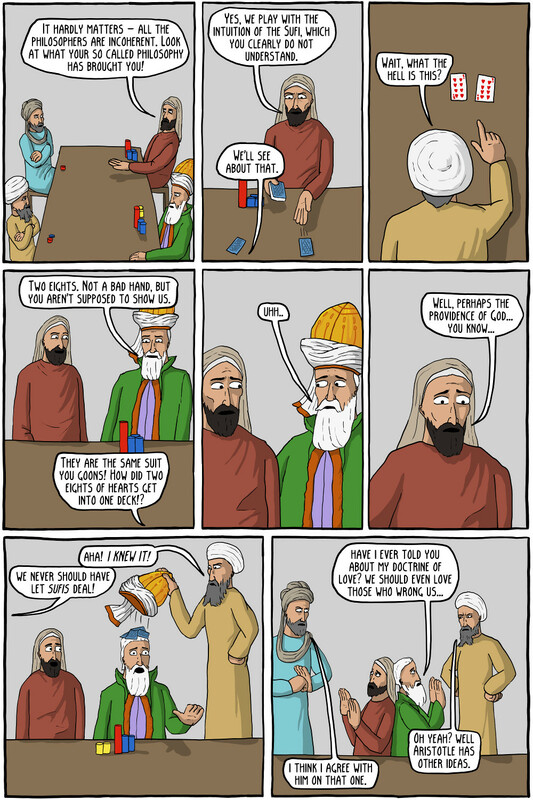 Averroes replied with The Incoherence of the Incoherence, but this, unfortunately, did not result in an infinite regress of replies. Rumi was a 13th century Persian Poet, Mystic, and Islamic Theologian. One of his central philosophical beliefs was that all creatures evolve towards love. Lower creatures evolve into higher creatures (man) which more perfectly represent love. Obviously, he lived before Darwin, so he mostly likely didn't mean biological evolution, but some kind of spiritual evolution.